I'm so glad we're on the same page with zucchini noodles. 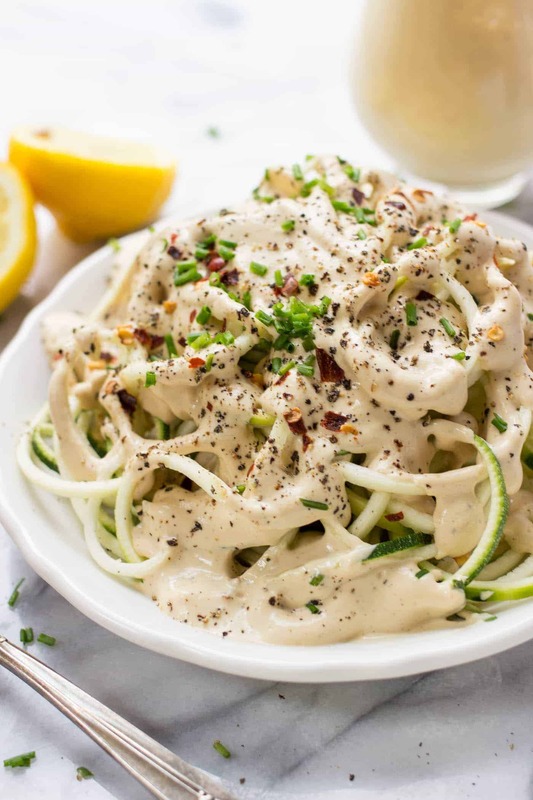 You guys have been loving all the spiralized recipes I've been posting, and seeing that we're still in the height of zucchini season I figured, let's keep rollin' with this trend. 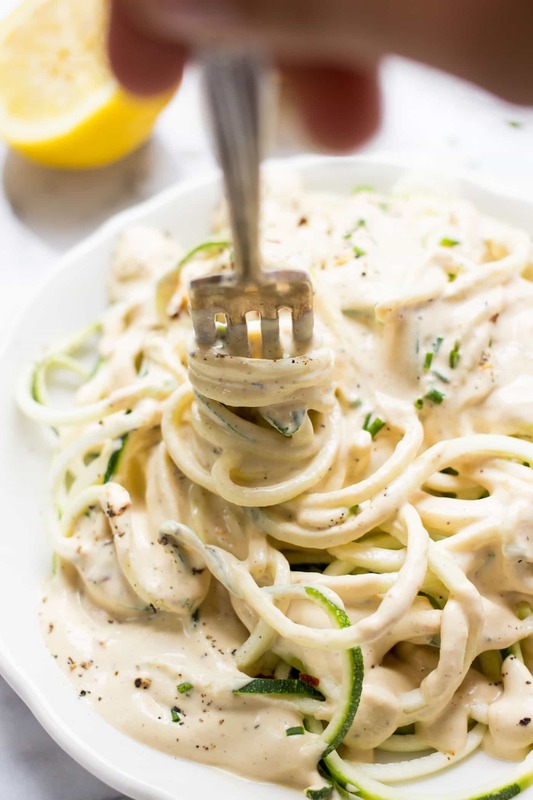 We've gone the traditional route with classic Pesto Zucchini Noodles as well as Avocado Pesto Zucchini Noodles, but as much as I adore my pesto, I think we need to shake things up. So today we're going with a decadent cheese sauce that just happens to be vegan! It's taken me a long time to get a “cheese” sauce that I was truly happy with, so I'm super excited to be sharing this with you today. 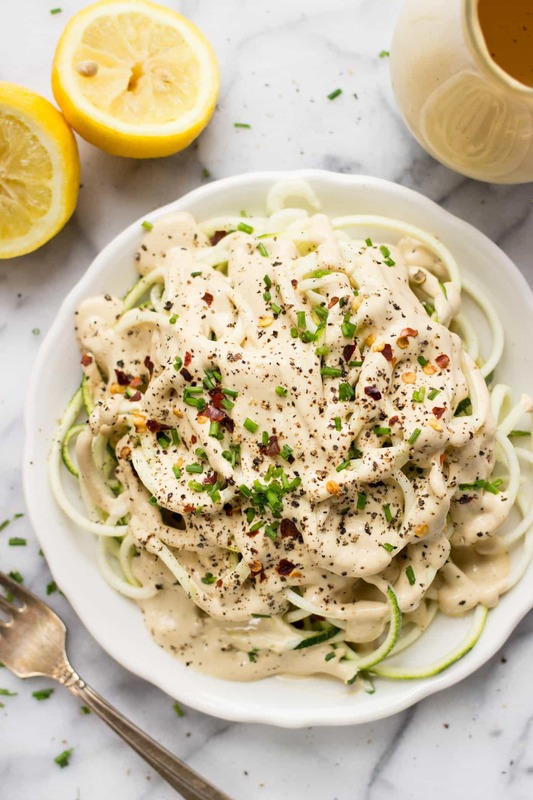 And surprisingly, this vegan lemon cream sauce doesn't use very many ingredients and it's a cinch to whip up. The base is soaked cashews which, when blended with liquid, turn into this incredible, thick, fluffy, luxurious cream texture. It's almost hard to believe that you don't need the actual cream. With that as our base, we can start to have some fun with the flavor. Just know that for this recipe, the nutritional yeast is making this sauce taste like a cheese sauce without adding in real cheese! Of course, since this is a vegan lemon cream sauce, we've got to have lemon. We're doing a whole 3 tablespoons of lemon juice, with the option to adding in some zest if you want it even more lemony. And because the lemon flavor is so key to this recipe, I definitely recommend that you use fresh squeezed and not the kind you buy in the bottle. The taste will just not be as authentic. The only strange-ish ingredient that we have in this sauce is miso paste. You've probably seen me use miso paste before (I especially like to add it to dressings), and you guys often ask how you can replace it since it isn't something most people stock in their fridge. But in this recipe, I think it's a fairly critical ingredient because it adds an umami flavor that is hard to replicate. To round out the rest of the flavor, we're adding in some tahini for a little nuttiness, fresh garlic, smoked paprika, nutmeg, salt and pepper. And then you just blend everything up with some water and you're done! 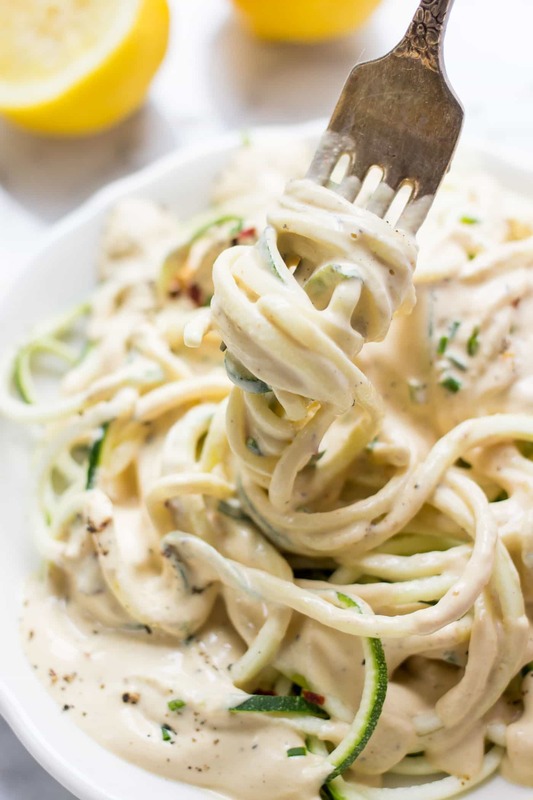 You guys know I love eating my zucchini noodles raw, mostly for the crunch, so I chose to serve this sauce over freshly spiralized zucchini noodles. But this sauce actually goes with everything. I used it in a pasta primavera last week, have put it over sweet potato noodles and even sauteed some zucchini noodles with the cream sauce. Every time I eat it, it blows me away. It's that good. It's a sauce I know I'll keep coming back to over and over again, and once you taste it, I think you'll see why. A versatile cream sauce that's healthy, not full of junk and tastes really damn delicious. What is your favorite type of pasta sauce? 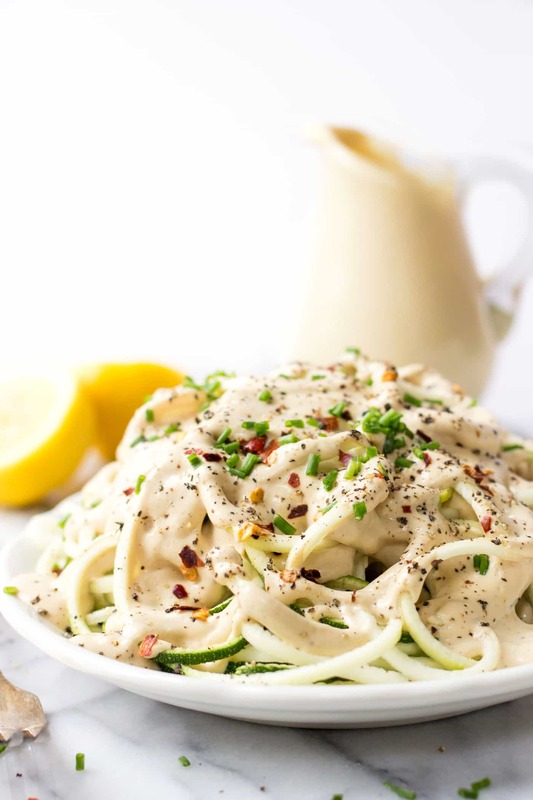 I'm thinking I'll share a few more zucchini noodle recipes before the end of summer, so let me know some of your faves in the comments below! Drain and rinse the cashews, then add them to a blender along with the remaining ingredients, starting with just 1/3 cup of water. 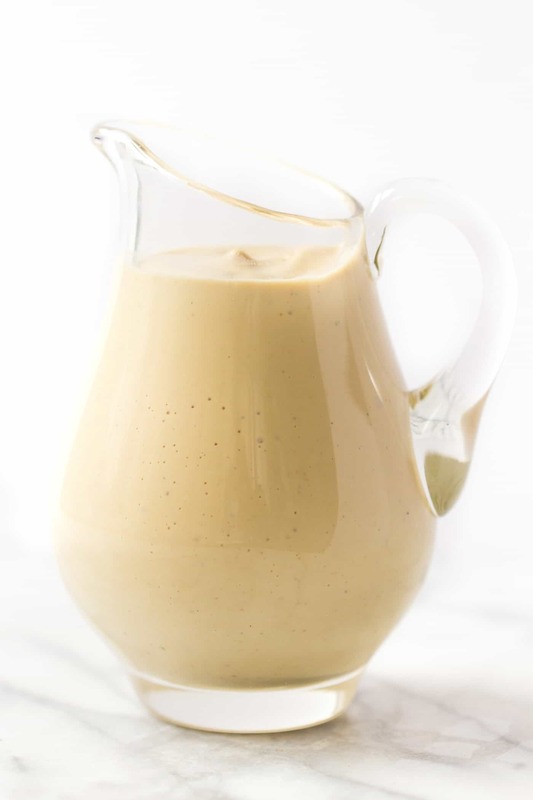 Blend on high until smooth and creamy, adding more water 1 tablespoon at a time until the sauce is pourable. Spiralize the zucchini and add them to a large bowl. Pour sauce over noodles and toss to combine. Serve immediately with fresh cracked pepper, chili flakes and chopped herbs if desired. If you have a high powered blender, you can get away with soaking the cashews in hot water for 30 - 45 minutes. Want more clean eating recipes? i made the lemon cashew sauce and mixed it with jasmine rice..imagine risotto consistency. my 9 year old twins loved it! Sounds absolutely incredible! I’m definitely going to give that a try 🙂 maybe mix in some mushrooms too! YUM! Never think that this vegan cream cheese does exist. I’m so in love with this vegan recipe! This looks amazing! I’m wondering how long this sauce will store in the fridge? I just made this because it’s (largely) compliant with the Whole 30 diet, and I love it! I’ll definitely continue to make it once I’m done with the diet. I just had it with butternut squash “noodles” and it was fabulous. Yay!!! And the butternut squash noodles sound absolutely fantastic! Man this looks good! I always come across the same problem..I have a bad tree nut allergy…and most vegan creamy sauces all have a nut base… 🙁 Do you think I could get away with just using a coconut milk or something? I know it probably wouldn’t be as creamy/thick but it disrupt the consistency in any other way? 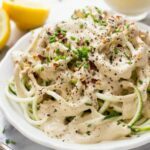 This was the best vegan cheese sauce I have add yet! I served it warm with pasta and cooked some shrimp and veggies in white whine and mixed it all together. SO GOOD! Thanks for the recipe. Looks amazing! How do you think this recipe would hold up without the nutritional yeast? It’s an allergen for my hubby. This is delicious! I served it with baked unseasoned salmon, and sautéed kale! Is there any sub for cashews? Im on low FODMAP diet and cashews are not permitted. 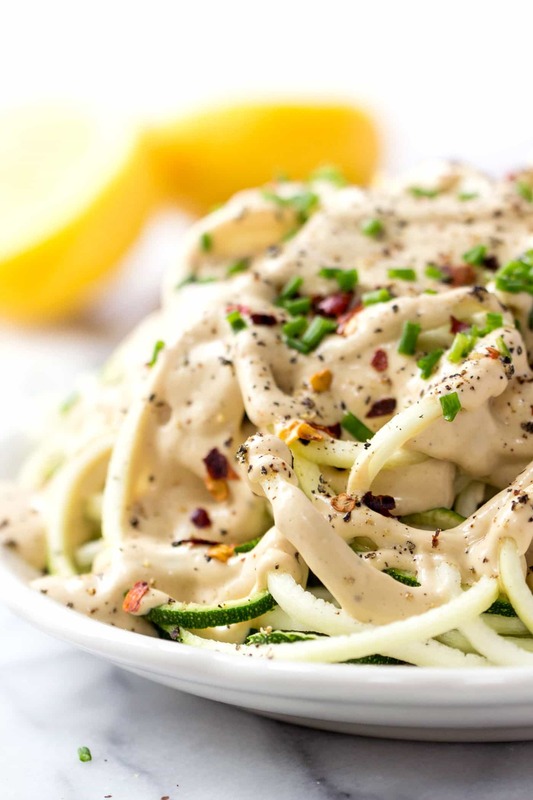 It looks delicious and love zucchini noodles! You could try macadamia nuts I think! Is there a certain kind of miso paste you use? I know there’s a couple different miso’s out there. Honestly, it doesn’t really matter 🙂 I personally like white chickpea miso the best though! Where can I find white chickpea miso? My roommate is VERY allergic to soy. I bet you can find it at a natural grocery store! its nice to slightly warm over a double boiler ..and if u salt lightly the zucchini .. and drain ,,off liquid … they get real soft!!! Thanks for the tips, I’ll def try that! Sounds wonderful……is it eaten cold? Not sure that my family would cope with cold sauce! Love love love everything about this! 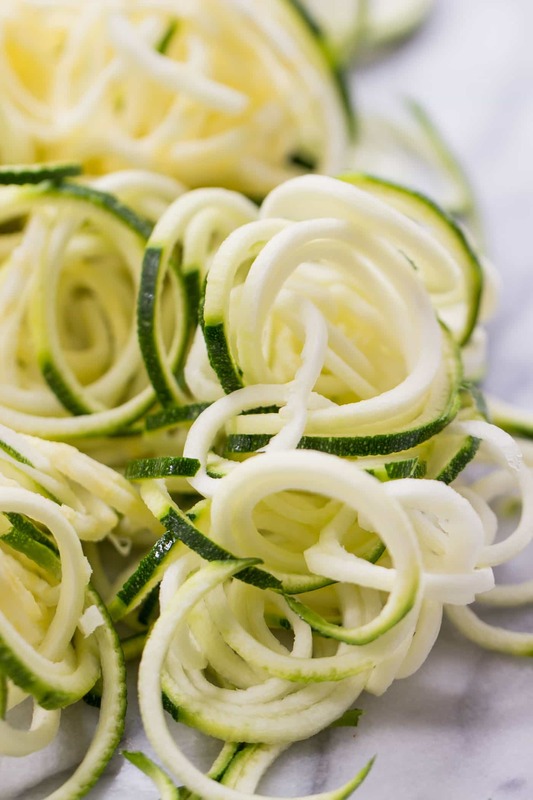 I seriously need to get my hands on a spiralizer so I can make zucchini noodles! Just shared the video on my fb page! This looks amazing! Definitely trying this! !